RinGs’ is excited to announce our involvement at the Fourth Global Symposium on Health Systems Research, held in Vancouver from 14-18 November 2016. Our events include a skills-building session on how to do gender analysis in health systems research, presentations and posters focusing on gender, ethics, and intersectionality, and a gender networking mixer. Health systems are not gender neutral; yet, health systems research (HSR) often fails to sufficiently consider gender as a social relation. The aim of this participatory session is to provide those interested in HSR with an introduction about how to conduct gender analysis within HSR. Too often inequities in terms of gender, age, class, sexuality, ethnicity, nationality within research systems, organisations and institutions are not the subject of enquiry. In this session we will interrogate these issues and formulate strategies to overcome the abuse of power and prejudice that hampers health systems research. Research in Gender and Ethics (RinGs): Building Stronger Health Systems, in conjunction with Women in Global Health, is hosting a gender networking meet and greet at the Fourth Global Symposium on Health Systems Research. If you work on gender and health systems, or are interested in the topic, please come and join us! All are welcome! 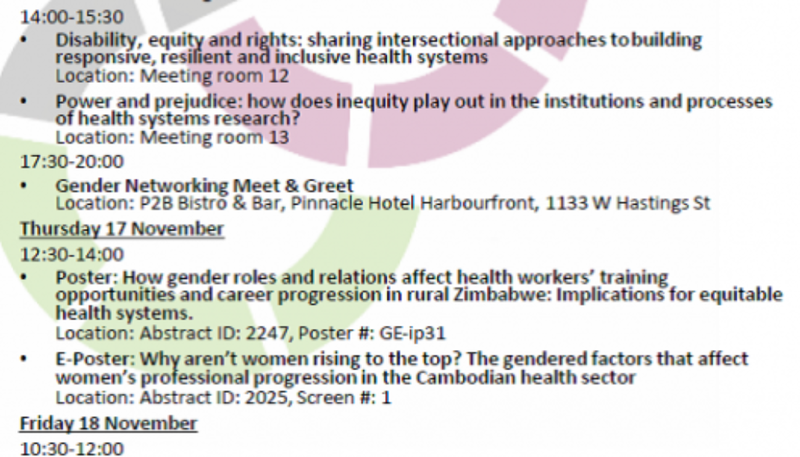 Poster: How gender roles and relations affect health workers’ training opportunities and career progression in rural Zimbabwe: Implications for equitable health systems. This session brings together innovative presentations that develop new concepts and approaches for incorporating ethical values and human rights considerations into health system operations (e.g. service delivery, governance, monitoring and evaluation). The ethical value of health justice is a common theme. Presentations in this session rely on a range of methodologies, including applied philosophy, photovoice, focus groups, interviews, and surveys, to develop these approaches, and draw on diverse experiences such as those of community health workers in Uganda and local government and civil society in India. Together they showcase ways to go forward for health care providers, policymakers, and implementers of family planning programs. This session brings together multiple cutting-edge presentations on the ethics of health systems research, applying the specific lenses of gender, power, and health justice to the topic. It will explore how health equity can be promoted through research practice and consortia governance. It will consider how gender and power relationships/dynamics shape the ethical issues that arise and the translation of ethical requirements into practice during the conduct of health systems research. The ethical guidance presented in this session draws from political philosophy, the outputs of dialogue-based methods, and multiple case studies from the African context.